Do Clothes Make a Messiah? Jesus' dress was simple—and probably scruffy. There's a reason that still matters. Joan Taylor is Professor of Christian Origins and Second Temple Judaism at King's College London. Over the past few decades, the question of what Jesus looked like has cropped up again and again. Much has been made of a digital reconstruction of a Judean man created for a BBC documentary, Son of God, in 2001. This was based on an ancient skull and, using the latest technology (as it was), shows the head of a stocky fellow with a somewhat worried expression. Rightly, the skin tone is olive, and the hair and beard black and shortish, but the nose, lips, neck, eyes, eyelids, eyebrows, fat cover, and expression are all totally conjectural. Putting flesh on ancient skulls is not an exact science, because the soft tissue and cartilage are unknown. Nevertheless, for me as a historian, trying to visualize Jesus accurately is a way to understand Jesus more accurately, too. The Jesus we’ve inherited from centuries of Christian art is not accurate, but it is a powerful brand. A man with long hair parted in the middle and a long beard—often with fair skin, light brown hair, and blue eyes—has become the widely accepted likeness. We imagine Jesus in long robes with baggy sleeves, as he is most often depicted in artworks over the centuries. In contemporary films, from Zefirelli’s Jesus of Nazareth (1977) onward, this styling prevails, even when Jesus’ clothing is considered poorly made. For me, Jesus’ appearance is not all about flesh and bones. After all, our bodies are not just bodies. As the sociologist Chris Shilling argues, they are “both personal resources and social symbols that ‘give off’ messages about identity.” We can be old, young, tall, short, weighty, thin, dark-skinned, light-skinned, frizzy-haired, straight-haired, and so on, but our appearance does not begin and end with our physical bodies. In a crowd, we may look for a friend’s scarf rather than their hair or nose. What we do with our bodies creates an appearance. And so Jesus’ appearance would have had much to do with what he was wearing. Once we’ve got the palette for his coloring right, given he was a Jewish man of the Middle East, how do we dress him? How did he seem to people of the time? There is no neat physical description of Jesus in the Gospels or in ancient Christian literature. But there are incidental details. From the Bible (for example, Mark 6:56) you can discover that he wore a mantle (a large shawl, or himation in Greek) that had tassels (described as “edges”). This type of mantle was a distinctively Jewish tallit. Today a tallit is a particular type of prayer shawl, but it has evolved a great deal since antiquity. In the time of Jesus, it was simply what a Jewish man wore all the time as his mantle. Usually made of wool, a mantle could be large or small, thick or fine, colored or natural, but for men there was a preference for undyed types. 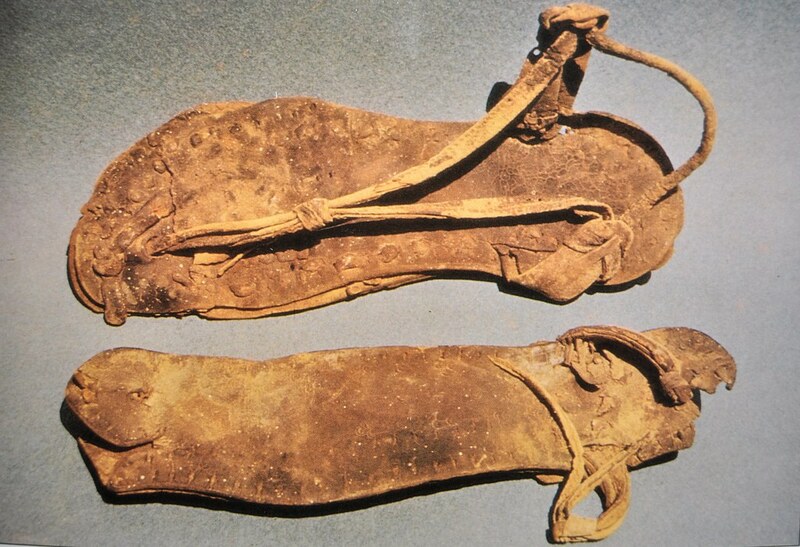 He walked in sandals, as implied in multiple Biblical passages (see Matthew 3:11; Mark 1:7, 6:9; John 1:27), and we now know what ancient Judean sandals were like as they have been preserved in dry caves by the Dead Sea. He wore a tunic (chitōn), which for men normally finished slightly below the knees, not at the ankles. Among men, only the very rich wore long tunics. Indeed, Jesus specifically identifies men who dress in long tunics, or stolai (Mark 12:38), as wrongly receiving honor from people who are impressed by their fine attire, when in fact they unjustly devour widows’ houses. Jesus’ tunic was also made of one piece of cloth only (John 19:23–24). That’s strange, because mostly tunics were made of two pieces sewn at the shoulders and sides. One-piece tunics in first-century Judea were normally thin undergarments or children’s wear. We shouldn’t think of contemporary underwear, but wearing a one-piece on its own was probably not good form. It was extremely basic. Perhaps it is unsurprising, then, that Jesus was remembered as looking shabby by a scholar named Celsus, writing in the mid-second century, in a treatise against the Christians. Celsus did his homework. He interviewed people, and he—like us—was quite interested in what Jesus looked like. From Jews and others he questioned, he heard that Jesus “wandered about most shamefully in the sight of all.” He “obtained his means of livelihood in a disgraceful and importunate way”—by begging or receiving donations. And so while Jesus wore similar clothes to other Jewish men in many respects, his “look” was scruffy. I doubt his hair was particularly long as depicted in most artwork, given male norms of the time, but it was surely not well-tended. Wearing a basic tunic that other people wore as an undergarment would fit with Jesus’ detachment regarding material things (Matthew 6:19–21, 28–29; Luke 6:34–35, 12:22–28) and concern for the poor (Luke 6:20–23).